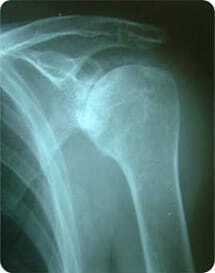 Arthritis is a term describing degenerative change in a joint. The most common type of arthritis is Osteoarthritis, which is often referred to as “wear and tear” changes affecting a major joint causing shoulder arthritis. There a many other types of arthritis, such as Rheumatoid arthritis, which are inflammatory conditions. Arthritis is a term describing degenerative change in a joint. The most common type of arthritis is Osteoarthritis, which is often referred to as “wear and tear” changes affecting a major joint. There a many other types of arthritis, such as Rheumatoid arthritis, which are inflammatory conditions. In the shoulder arthritis can affect the shoulder joint (gleno-humeral joint), or the Acromioclavicular joint between the clavicle (collarbone) and acromion (shoulder-blade). Both osteoarthritis and inflammatory arthritis can affect these joints, leading to pain and stiffness. In the shoulder another type of arthritis can occur, Cuff-tear arthritis, which is due to long standing tears of the rotator cuff tendons and produces symptoms similar to osteoarthritis. Arthritis is most common with advancing age, and symptoms are often mild and intermittent in the early stages, though slow progression is usual. Occasionally people who have had injuries to their shoulder, or have inflamatory arthritis, can develop arthritis at an earlier age. Arthroscopy: Debridement and washout of the joint can relieve the symptoms of arthritis, but does not get rid of the arthritis. Joint replacement (arthroplasty): This is the most common surgical treatment for arthritis (see surgery section). Excision of an arthritic Acromio-clavicular Joint. If the acromioclavicular joint has been injured previously or if there is evidence of arthritis, debridement or excision of the joint may be performed. Often this is performed in conjunction with a subacromial decompression. The operation is again usually performed with regional anaesthesia involving a nerve block to the ar, together with sedation or general anaesthetic depending on the individual. The operation is generally performed as a day case or over night stay if performed late in the day. The aim of the operation is to remove the worn surfaces of the joint, together with the damaged intraarticular disc, which lies between them. 3 small (0.5cm) wounds are required in order to introduce the arthroscope (camera) and the instruments. A shaver is utilised to remove the pathological tissue. 0.5 – 1.0 cm of the bone may be excised from the end of the clavicle (collar bone). Following the surgery the arm is placed in a sling for 2 – 3 days. By 2 weeks post surgery, the patient should be able to raise the arm above shoulder height, achieving full range shortly afterwards, as the bruising from the operation resolves. Patients resume driving 1 – 2 weeks after the intervention. By 8 weeks postoperative, a full range of movement and reasonable strength should have been regained (80% normal). Further progress can then be achieved over a 6 month period. Physiotherapy is required to retain muscles and restore normal posture and movement patterns. To ask a question about shoulder arthritis or to book an appointment, contact our specialist team available Monday – Friday 8am – 6pm. Our shoulder team have a dedicated and caring approach and will seek to find you the earliest appointment possible with the correct specialist for your needs.